Regs Should you wish to check anything. Event Index: Info, Snippets, Ben's Press Report, Section Statistics. Final Results are now up. This is a Sunday Trial for youth and adults of all abilities which also happens to be day 3 of the ACU Western's Youth Development Squad's Summer Training Camp. Adults and youths who have booked into one or both training days can try out their newly found skills in a proper trial on whatever level route they choose. The farm venue is walking distance from a campsite and a great pub to relax and dine in. The venue is right on the Welsh Border and entries are open to any other centres too. The ACU Western Youth Development Squad, who make this Trial possible and provide workers to help West Glos, have regular updates on their Facebook page and more info about how to book future training days on the ACU Western website. All that previous Sun. All that promised Rain - What happened? well it wasn' too bad actually, rain overnight and for the first hour but then the sun broke through until we had finished clearing up.. Thanks also to our clearing crew the week before Simon & Elyn Welch, Tom & Ollie Goode, Chris Morris, Steve Thomas and Colin Jones. Also thanks to the coaches who raised the peg for a number of riders and helped plot and mark out Sunday's sections. A quick look at the severity of the different routes ridden using the Statistics table below shows that the Conducted Expert route was the toughest. You adults think you have it hard! Tony Falconer had the delightful new steep loose rock stream section to observe with a nice 3ft rock step to launch at before a tight turn out straight after - the toughest section for Clubman and Club/Exp riders. Dozens of riders improved their skills then put them in to practice during a three day training and trial at a famous trials venue. Two days of coaching from the ACU Western Youth Development Squad were followed by a trial run by West Glos & Dean Forest MCC at Longtown, in the shadow of the Black Mountains, an area known for the National Valley AC Traders Trial for many years. 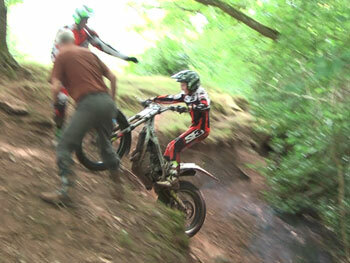 A total of 50 coaching slots were filled by riders who came along for one day or both, and some stayed for the trial too. 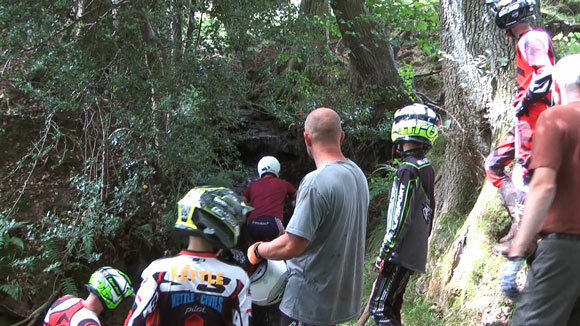 The venue is riven with rocky gullies and there was enough variety ranging from gentle stream beds to monster steps to test everyone from the youngest class E riders on electric bikes to more mature riders wanting to brush up on their skills. Squad leader Simon Welch signed up coaches Jason Bendall, Ben and Dean Lovelace, Ben Bishop and Fred Adams plus assistant Tom Culliford to pass on their experience on the Friday and the Saturday, before he won the trial on clean on the Sunday. 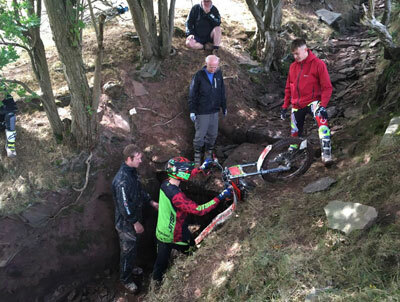 Simon was tracked closely by Joe Bendall all the way through the trial, it was the ideal opportunity for Youth A rider Ollie Goode to try out the Expert route alongside those two experienced experts. Being so close to the Welsh border, a significant part of the entry came from Welsh riders including Clubman/Expert route winner Julian Collins, who edged Andy Hayward in to second. On his home territory, Dan Sanders had an uncharacteristically difficult day, to finish third on his Yamaha TY250 Mono. A two and a pair of fives on second 11's drop in and out of a very narrow gully almost doubled his score - then he cleaned it after the trial. Veteran former ACU Western trials champion Nick Draper topped the Clubman class on his TY250 Mono before comparing notes and modifications with Dan on their machines after the trial. Welshmen Martin Jones and Andrew Tamplin filled the podium spots behind Nick. A very regular and welcome visitor to ACU Western trials, Dai Clothier was a convincing winner in the Sportsman Plus class, and Dan's dad John took Sportsman honours. The event's aim is mainly to bring on young talent and it was pleasing to see Brianna King, Rhodri Tamplin, Fred Bishop and Harry Drewitt all take on the main trial with confidence on the Sportsman route. If there was an award for endeavour, a strong contender would have to be Mervyn Powell who rode the Clubman route on his Matchless 350 and posted a very respectable score – before handing it to Simon Welch for an attempt at that troublesome section 11 which even he had to surrender to. The YDS and West Glos & Dean Forest MCC would like to thank all the coaches and officials, and the landowner for making this such a successful event. We may have some clips while our trainees were pushing their limits. Coming to this website soon. To view in HD you need to click the HD or Vimeo link to open on their site.